Obsolete, dead inventory haunts most businesses, especially growing companies in need of cash. Old product lines failed concepts, or just too much of what used to be good inventory can weigh on your balance sheet and drag down investment in future opportunities. But when it’s your channel partners that are struggling to liquidate inventory, your guidance and consultation hold value. 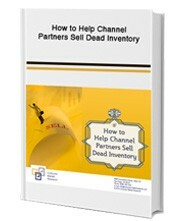 To find out how to help channel partners sell dead inventory fill out the form on the right and receive your Free copy.